I’m in England now, about to start on a ten-day garden tour. With my co-host Julia Guest of Travel Concepts in Vancouver, I will take a small group of women to the southwest of England. But before hitting the road, let me whet your appetite with a review of an extraordinary garden I visited pre-tour. 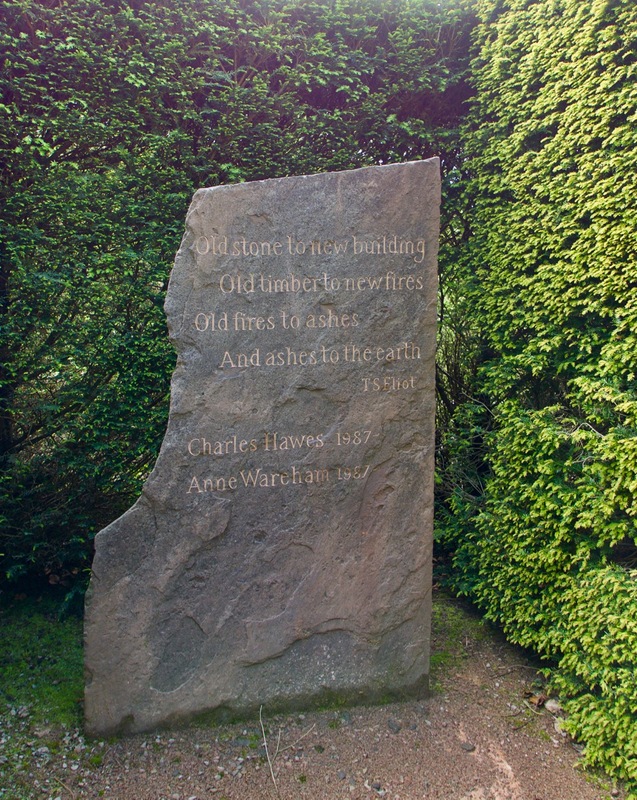 Veddw is the garden of Anne Wareham and Charles Hawes. Located in Wales, just across the border from England in an area of outstanding natural beauty, Veddw pays homage to its surroundings in ways that show respect for what came before. And significantly, that respectful attitude, felt throughout the garden, highlights the design talents of its creators. 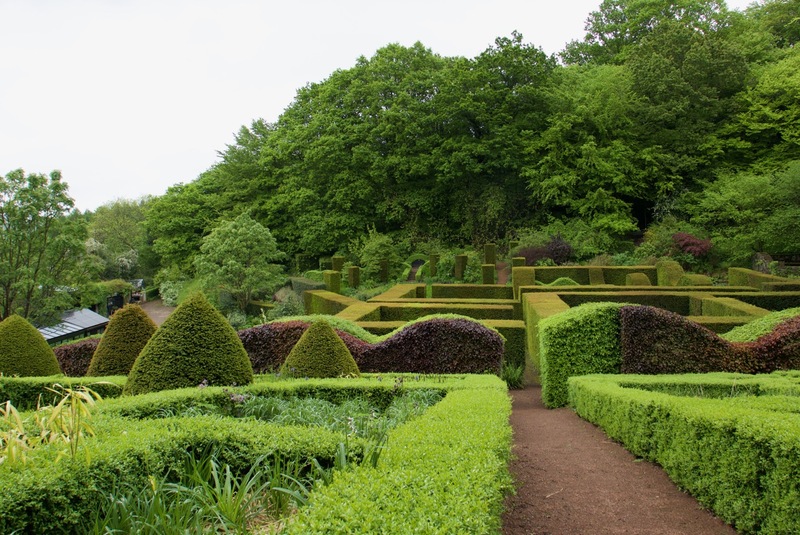 English gardens that nod to the past are a commonplace but Veddw is no ordinary garden. A bench at the entry to the garden announces the difference, first in its shape and colour and then in the words that appear on the back, names used for the property over several centuries. Vedow,, Veadow, Fedw, Vadda, Veddw. From 1569 to 1947, the spelling has changed but the sound remains much the same. 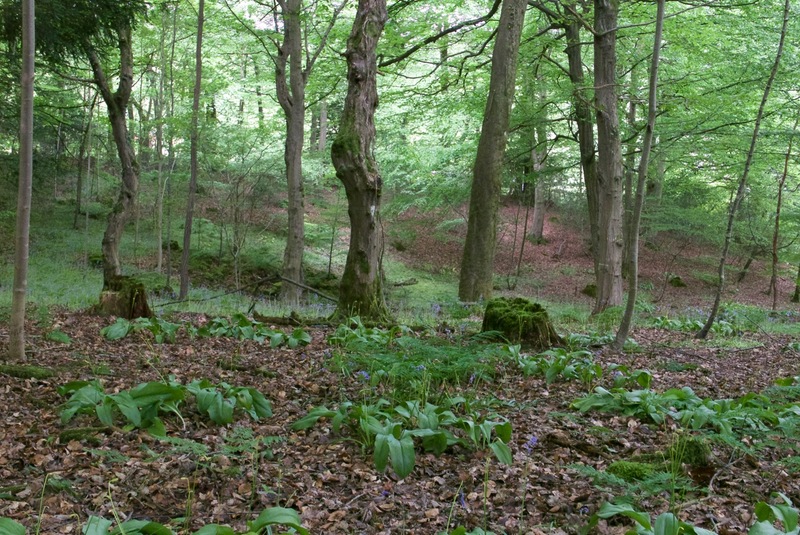 At the edge of a wild garden, headstones give alternate names for people and areas nearby. Barely visible is a wonderfully evocative name: Bulchey Bernard. And why Hatter’s Patch? Were hats made there by Mr. Bernard? Veddw and its designers do more, though, than show respect for the past. The garden they have created is very much of the present, yet it draws on ideas of time and change that are common to gardens everywhere. Attention to detail is evident throughout… not in the ordinary ‘garden variety’ way where all is neat and tidy, with no weeds apparent, but in the subtlety with which design creates meaning and significance. Every garden design manual will advise repeating plants, colours and shapes, stressing that repetition holds a garden together, gives it coherence. And I agree. But too often, repetition of the sort advised hits you in the face, as if carbon paper had been pressed over a good idea and then imprinted mindlessly from one area to another. Not so at Veddw. Here, the garden coheres through a more nuanced approach. The curve of hedges is repeated in the roofline of what once was a tiny stone house. 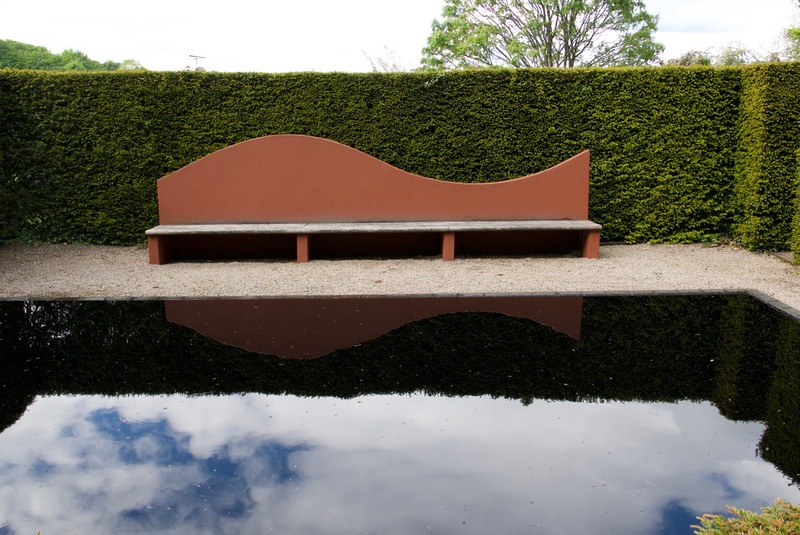 The curve of the entry bench is echoed in the curves of a bench by a reflecting pool, but here the curve is modified with a dip that suggests what is about to come. Black water reflects an overcast sky. Water features, each different in size and shape, repeatedly bring the sky onto the ground, another subtle repetition. For me, the marvel at Veddw is the Hedge Garden. 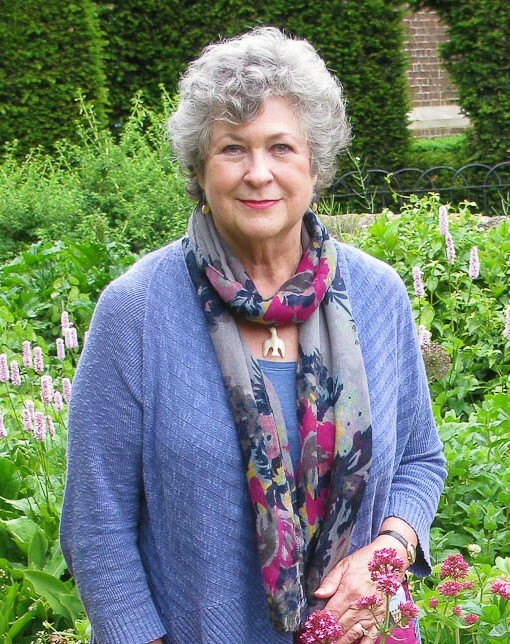 Designing interlocking hedges that appeal from every direction is a challenge that designer Anne Wareham has met, seemingly with ease. At the entry to the garden, a visitor encounters a genuine Wow! moment. 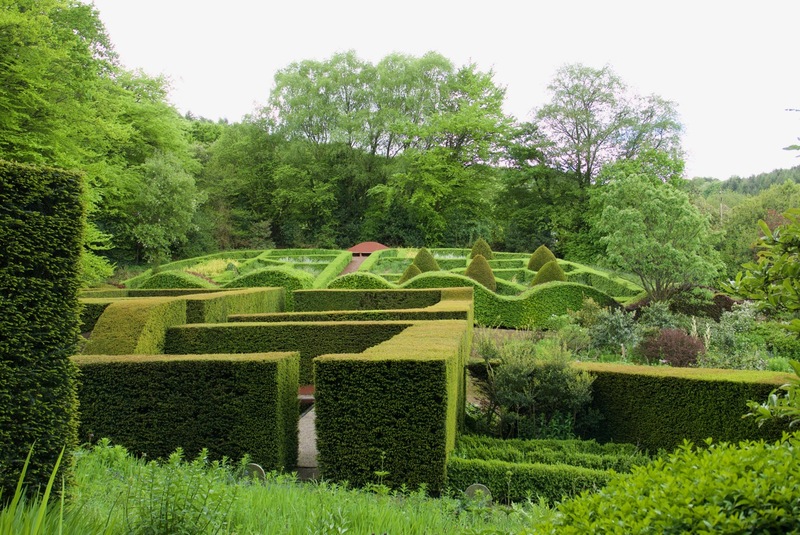 Stretched across the valley below are scalloped-topped hedges set against flat-topped ones. Shades of green repeat and shift, balanced with touches of maroon and rust. Cones in the foreground are echoed by square columns in the distance. And all this energy is anchored by a calm backdrop of trees that promise a garden of a different sort. Intricately interwoven shapes, with flat and scalloped tops, cones and columns, are made even more intricate with different plants and colours. While they are barely visible in this photo, the yew columns on the far hillside to the left were one of my favourite features. To create a view this satisfying from one angle isn’t easy. To make it equally satisfying from the opposite direction adds another level of difficulty. Wareham has met the challenge and succeeded. 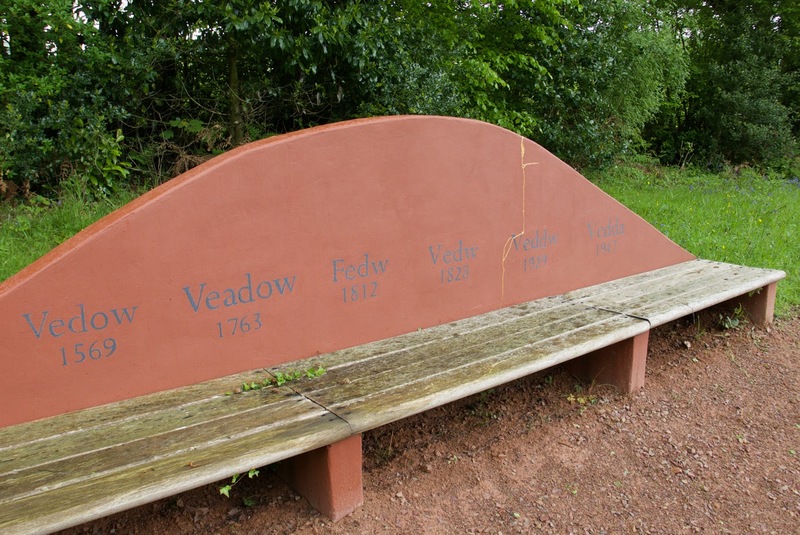 A view from the hillside opposite shows the bench listing Veddw’s various names at the top of the photo. In the foreground you can see a tiny entry into the Pool Garden. 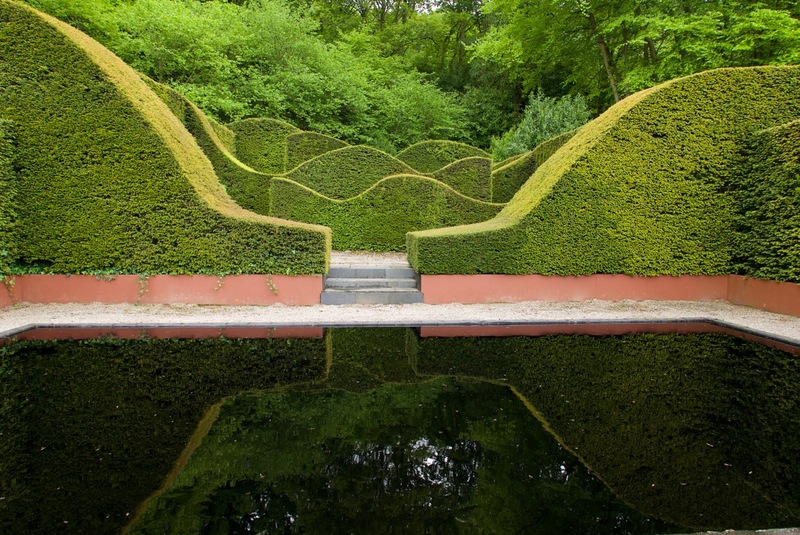 In the Pool Garden, the interwoven hedges become a complex play of curves. Do they rise and fall like waves on a distant sea or do they mimic the rising and falling hills that surround Veddw? No matter. Their reflections in the dark water form an inverted goblet that spills out an invitation to enter the underwater world beyond. These hedges were tiny when planted. Very tiny — about ankle high. Getting the proportions right must have been a nightmare. A path continues around the reflecting pool to enter the Hedge Garden. Turning a corner, waves appear again, this time in a contrasting colour — the fresh green of boxwood set against the darker tones of yew. 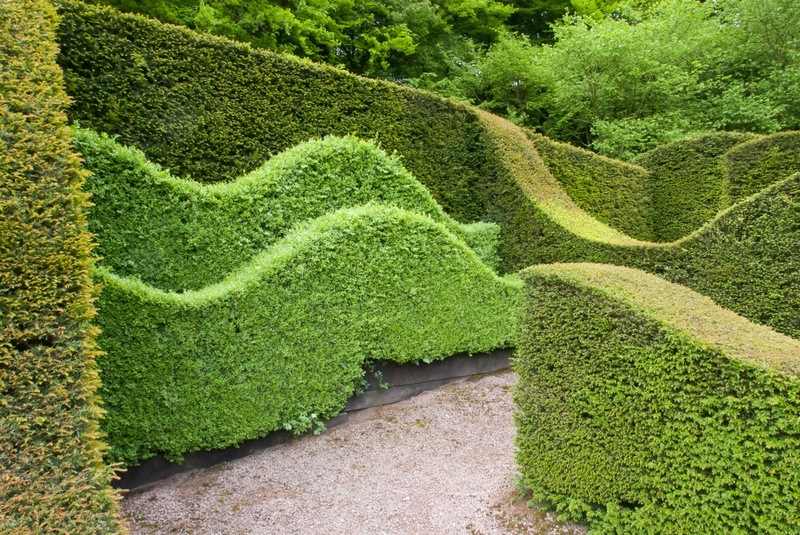 The curving waves appearing on a side hedge draw you into the garden world beyond. A twisted tree watches over a peaceful fern-filled valley. The bluebells were past their peak but still gave off a hint of blue. … where the ruins of an old farm building, once in the middle of an open field, have become a mysterious shrine. 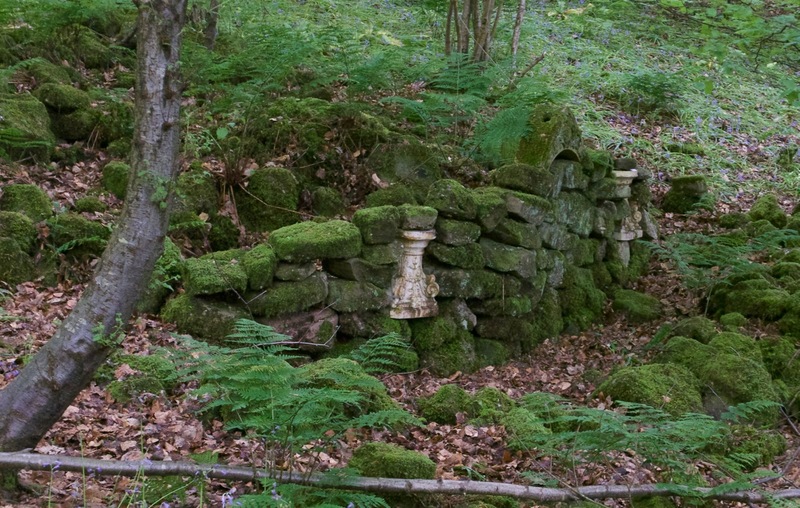 A utilitarian stone hut changed its character when softened and romanticized with moss. The columns hint at some grander past, now cloaked in mystery. There is much more to Veddw than hedges and romantic woods. There are open sunny borders, a delightful garden stuffed with cardoon and shaped boxwood, a meadow walk and a white Clematis montana so tall it might almost be visible from outer space. 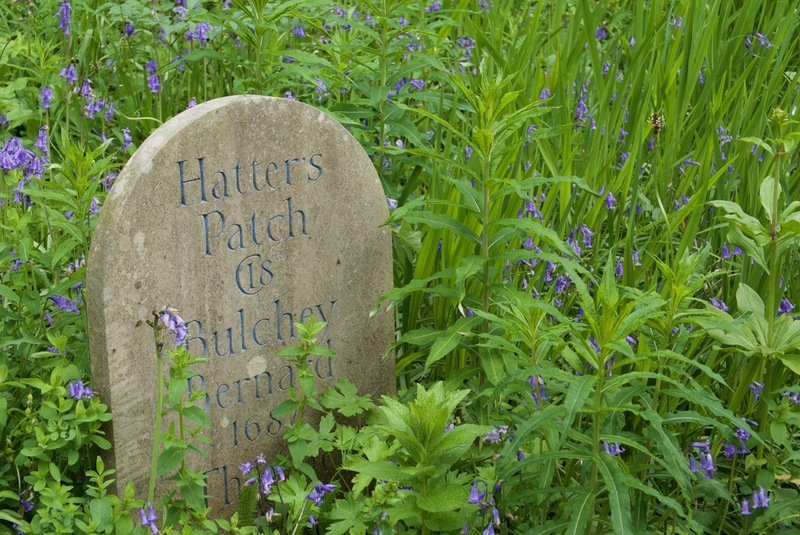 Hatter’s Patch and Bulchey Bernard are only two of many ways that words are used to link the garden to a wider world. A quotation from Wordsworth’s poem about nearby Tintern Abbey appears on a wooden bench, connecting the garden to the fields around. (“These hedgerows, hardly hedgerows, little lines of sportive wood run wild…”) T.S. Eliot is quoted on an irregular stone, the words suggesting the progression that occurs when past and present, repeated, are brought together in new ways. Old stone to new building: a repurposed stone provides a suitable place for a repurposed quotation from “East Coker,” one of Eliot’s Four Quartets. 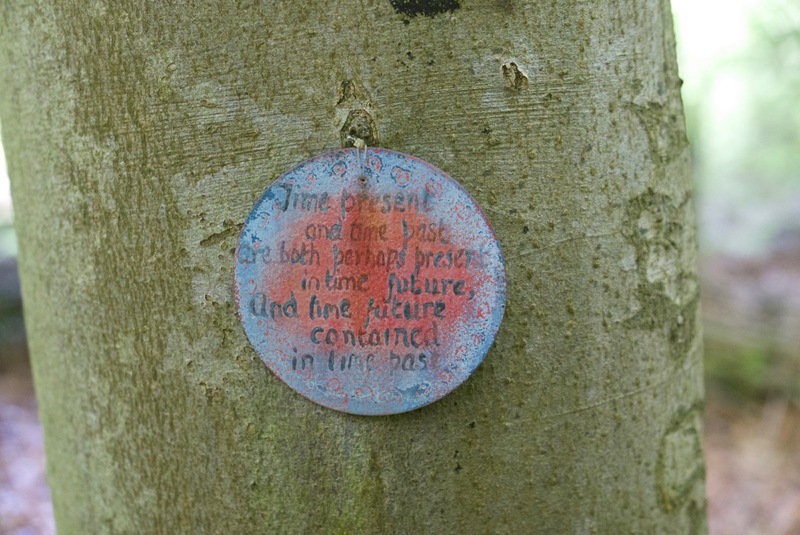 A small, weathered plaque attached to a tree speaks to what a garden is, or can be. At Veddw, the words articulate what the garden says: past is present, present, past. The future is still becoming. This quotation from Burnt Norton, the first of T.S. Eliot’s Four Quartets, encapsulates a crucial component of the garden at Veddw. And of every garden worth its name. Veddw is open on Sunday afternoons in June and July and from August 2-5. Groups of ten or more are welcome by prior arrangement from May to September. If you have the chance, go. This is a garden worth the detour.